This is a phenomenal 1938-S Jefferson that I am VERY proud to offer! Not only is it a rare, PRISTINE, early-date Jefferson with only 60 graded and just 3 graded higher, it also offers stunning swirls of color! 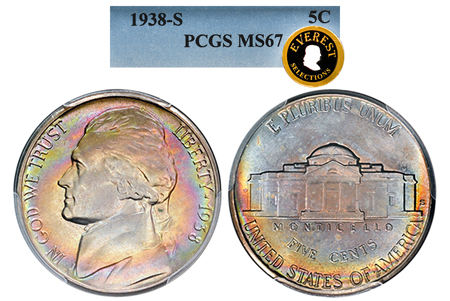 Swirls of fuchsia, emerald green, lemon yellow, sky-blue, ocean blue, amethyst, and tangerine cover most of the obverse and reverse in a fantastic display. Near flawless, this gem holds almost no bagmarks. An Everest in pristine, rare condition and knockout eye-appeal!